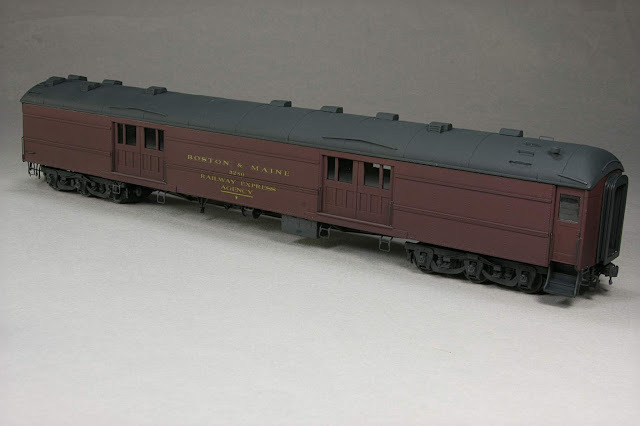 Building a model of this converted B&M baggage express car has been an interesting adventure and learning experience starting from the 1958 J. W. Swanberg photo taken in Danbury Connecticut. 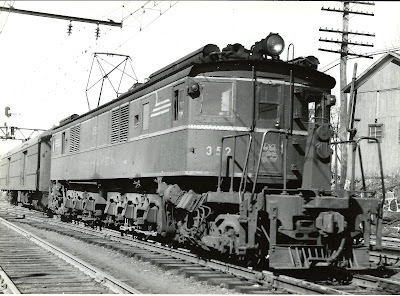 New Haven EP-3 # 352 was obviously the primary focus of this photo but coupled to motor #352 was an unidentifiable baggage express car with a vestibule on only one end. 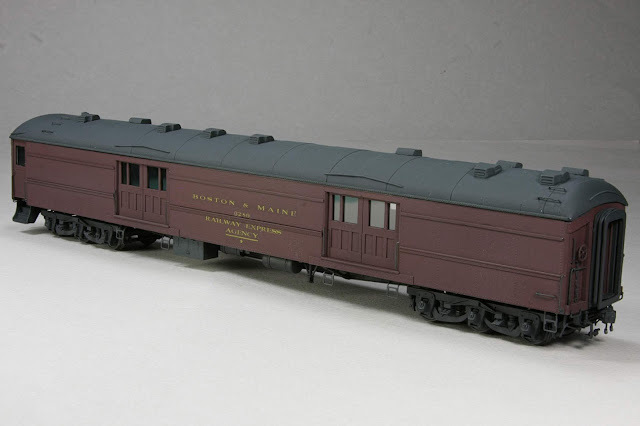 Thinking that this Non-Haven car would add operational diversity from the home road baggage express cars piqued an interest in building a model of this car. Fortunately several knowledgeable people answered my blog and NHRHTA forum questions for the identity of this car, they are named in part one and I once again thank them for their contributions. Photo and dimensional evidence of the prototype car is very limited, what remained unknown is conjecture on my part but I hope finished end product below can be considered a credible model of the prototype. What is going on in this photo? The below photo attempts to recreate the original operational movement captured in the 1958 J. W. Swanberg photo. New York Grand Central Terminal to Pittsfield Massachusetts Train #140 The Mahaiwe has arrived at the end of the Berkshire electrified track at Danbury Connecticut at 10:19 AM. Motor #352 and Harlem River to Danbury express car #3280 are cut off from train #140 and are pulling forward to clear the crossover from track #6 to track #8, once clear the express car will be backed thru the crossover onto track #8 to a location near the station for unloading. Motor #352 will then pull forward to motor service further east in Danbury yard. Train #140 continues with diesel power departing Danbury station at 10:29 AM for the remaining 89 mile run to Pittsfield, MA. Simply stunning. Love all the roof top detail. Thanks. Many of roof details reminiscent of a very nicely built Canadian National RPO/Express car I remember seeing on your blog! Joe did you bend up the roof grab iron with the bumps in it that is wider than the rest or is this available as a detail part from someone? 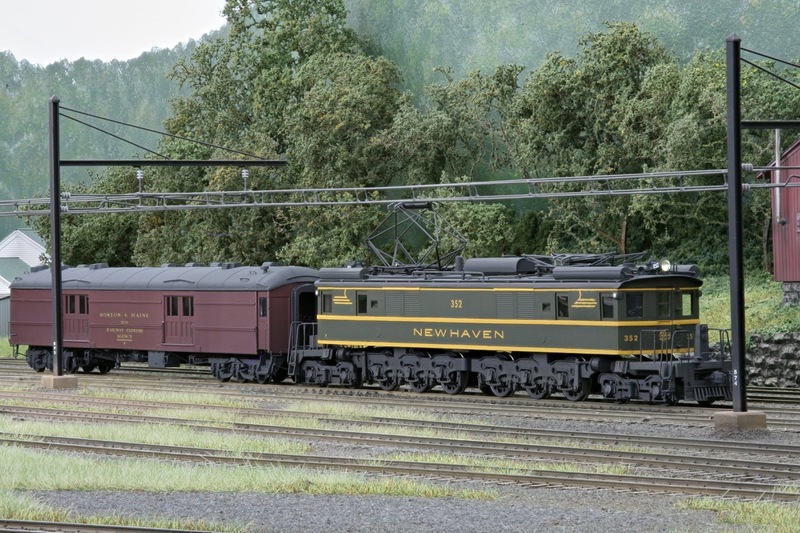 Ryan, The ladder rests are available from americanscalemodels.com the product code is 9944. Wish I had known about these when I built my RPO's, may try to retrofit. Incredible work, as usual. You are a master! Very nice indeed Joe. Whose brake ratCHet is that; don't recognize it? Thanks! 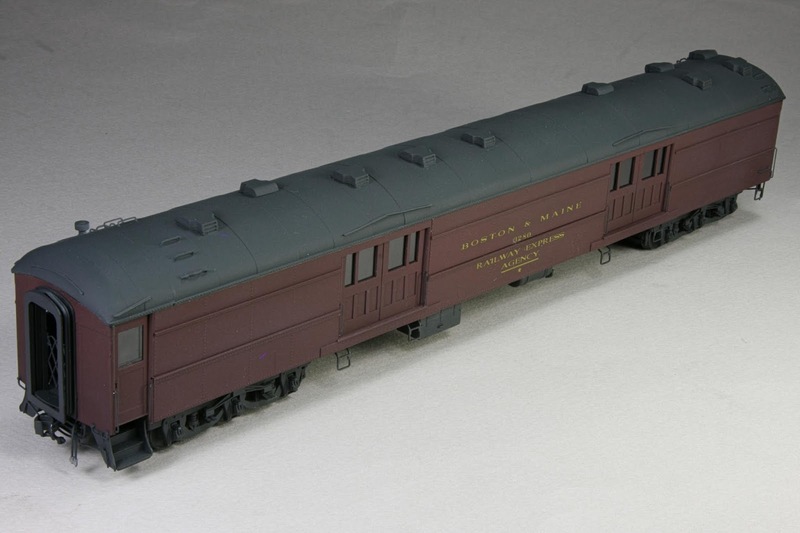 I don't recognize it ether Jim, I harvested it off the same Athearn passenger car that the roof came from. Maybe something Irv Athearn designed?